In a medium bowl whisk together salt, cocoa, and sugar. In a large mixing bowl whip the margarine until creamy. Gradually mix in the sugar mixture alternating each time with the coconut milk or coffee until are ingredients are mixed. Mix in vanilla and stir well. Refrigerate until it’s time to use, let sit for 5 minutes until spreading on the cake. 1 cup of pecans, half of them chopped. Make your two cake rounds first as the instructions say. Let them cool on a rack for at least an hour. 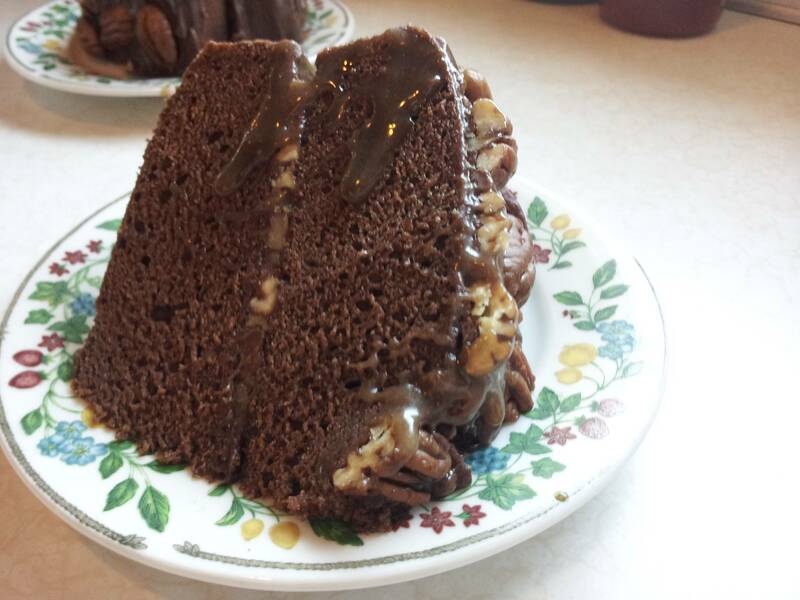 When the cake is cooled, spread 1/3 to 1/2 of the chocolate frosting on. Then drizzle some caramel on top of the frosting. 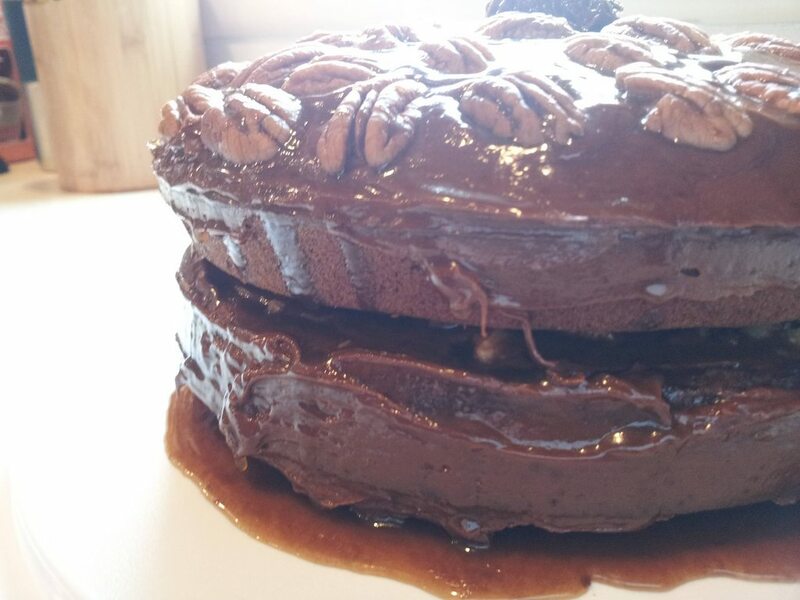 Next, scatter some chopped pecans on top of the caramel and press them into the cake with a soft spatula or a spoon. Stack the second cake round on top and make sure it’s stable. Spread the remaining chocolate frosting (I actually had a few spoonfuls leftover) on top. Drizzle as much caramel as you want on top. 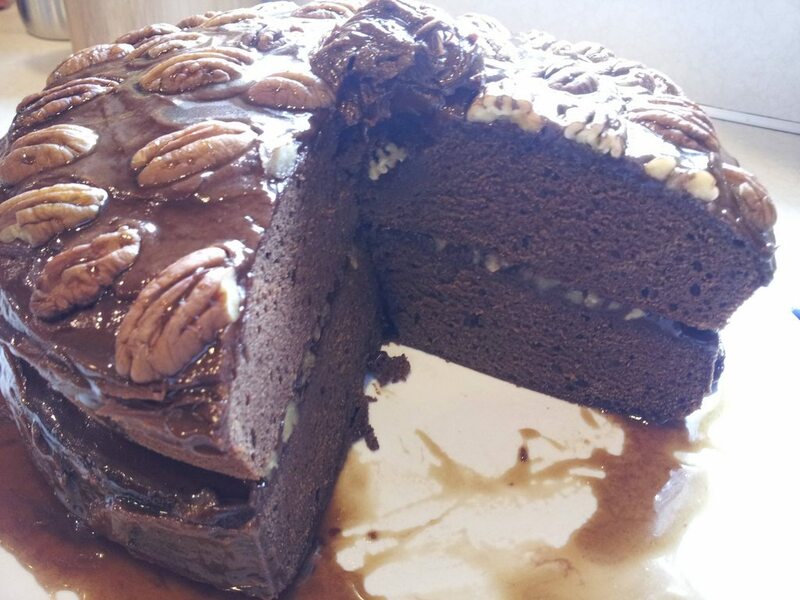 Don’t be scared to let it drip down the sides, it’s what makes it delicious 😉 To finish the cake add the whole pecans on top. You could also chop them up and sprinkle them if you want. Refrigerate afterwards to keep it from melting. When you’re ready to serve, microwave it for 15-30 seconds and enjoy!